Looks like a different take on a bird’s eye view. Sean’s comment is to the point. A different view on the bird’s eye view. Beautiful photo and good dof. 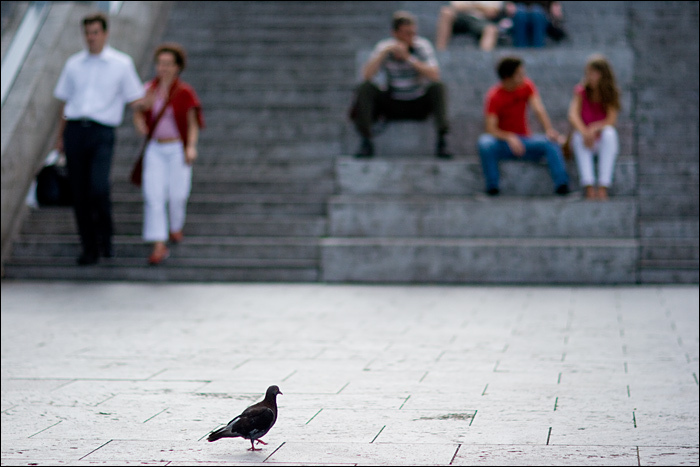 A very interesting perspective: a bird as the subject and humans as the background. Good eye! Great again! Could you post any advices in my blog? Thanks a lot!!! Excellent use of shallow Depth of Field. The gray patterns and the colorful patches of the people form an excellent background. This is great – I love the way pigeons stroll around like they own the place. The composition is perfect. rename this to ‘as time flies by’?! Loved your photos. You really have some great work here. I love the composition and the focus on this one. Love the focus in this. It’s unusual to see not see people “in the spotlight” of pictures, but it has a really nice effect. yeah i like the DOF seems like a very good thought to include movement. even the contrasting colors in the background work great. Seems like you’re at your best with the creative DOF. A real classic. One of your most ironic images, rich in incongruity and humor. The sharply focused bird hold center stage here. Nobody in the image takes not of it, but you make the journey of a small bird more important here than the human activity behind it by using selective focus to blur them out. Well conceived and executed, Krasimir. Интересно, а комменты которые не нравятся автору здесь стирают?